In early January, NFL Films contacted Paladin Music and Entertainment to assist in finding a shoot location as well as the casting of knights for their upcoming project. Eight knights, two on horseback and the rest on foot, would represent the final eight NFL teams leading up to the Super Bowl. On Friday, January 18th, a crew from NFL Films met with PM&E President, Chris Lance and his long time friend and business colleague, Matty, owner of Four Sisters Winery to look over the site. On Thursday, January 24 amidst the rain and the mud, the trucks rolled in, the horses came out and the knights donned their armor. Paladin Music Production Assistant, Shanna was on site: "It was a grueling day, from 2pm to 2 am. The mud got deeper and the weather got colder. But everybody had a great time and we pulled through for NFL Films!" Four cameras captured the action as special lighting and fire effects lit up the hazy night sky. Hot and cold meals broke up the evening as crews scrambled to set up new locations for the next shoot. The Paladin Knight was there, of course, fighting for this team, disappearing as mysteriously as he had shown up. Many thanks to the paid and non-paid actors and staff who gave over 100% to the project! Reporters from the The Star Ledger and Express-Times were present. Below is an Express-Times Newspaper article written by a reporter that was on location, reprinted here with permission. WHITE TWP. - Two jet black stallions charge through a cold winter mist. With thundering hooves tearing at the muddy earth and flaring nostrils steaming, they carry their riders - two knights in shining armor - on a dash toward victory. From a staff in one knights hands, a banner, bearing the crest of the Pittsburgh Steelers, waves in the wind. This unusual juxtaposition of medieval gallantry and the National Football League unfolded Thursday at Four Sisters Winery. NFL Films of Mount Laurel, N.J., chose the Warren County vineyard to film an opening segment for a direct-to-video production about the 2002 NFL playoffs. The video, to be released five days after the Super Bowl, is designed for an off-season promotion of NFL Football. Assistant Producer Craig Carpenter said the film will use the pageantry of medieval times as a metaphor for the battles between the 12 teams vying for the NFL championship title. Complete with sword fights between knights representing the playoff contenders, the sequence will use a variation of the legend of Arthur, king of the Britons, Carpenter said. As the NFL version of the legend goes, Arthur began his reign after the mythical Lady of the Lake bestowed upon him the Lombardi Trophy. In the actual legend it was a sword, but the script takes liberties, Carpenter said. An actor using scuba gear will raise a replica of the football-topped Lombardi Trophy from a pond at the vineyard for the film. The real sterling silver Lombardi Trophy, worth $12,500, was on location for other shots but kept under lock and key, Carpenter said. "Were not bringing it out until we absolutely have to," he said. As dusk gathered at the winery off Route 519, a small horde of medieval warriors like "Shandor," an auto worker from South Brunswick, N.J., donned armor and swords. His real name is Alex Choma and said he specializes in "villainy and treachery." He was cast as an extra in the production. "I get hit and I fall down," he said. "I always lose. Im the bad guy." Choma is one of a number of medieval re-enactors cast for the production who appear at a renaissance fair at the winery each summer. Carpenter said NFL Films contacted Paladin Music and Entertainment Production Co., which runs the renaissance fair. The vineyard was familiar to the actors. With gnarled trees shrouded in mist, it was the perfect setting for the shoot, Carpenter said. 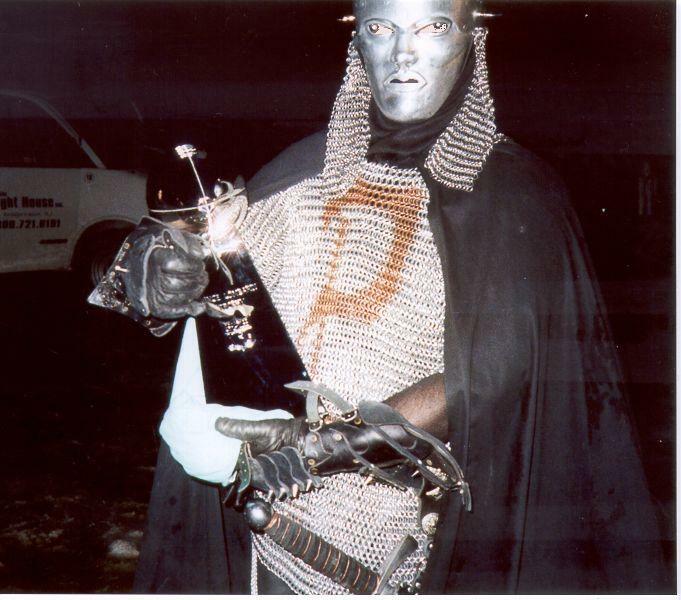 A spokesman for Paladin, also named Paladin, was clad in chain mail emblazoned with a red "P." He wore a hooded black cloak and a silver face mask with glowing blue eyes. He wouldnt break character to speak. Choma explained that one of his archers had shot Paladin in the throat 1,500 years ago. Paladin then produced a business card from a leather pouch on his belt. Each of the actors in the battle scene will carry a shield emblazoned with the logo of an NFL playoff team. "Hack the Headhunter," really Dennis Daniels of Red Bank, N.J., said the director told him he would carry the shield with the Oakland Raiders logo into battle. "I said Id rather be the Steelers," said Daniels, a New York Giants fan in real life. He explained hed rather represent a team that still has a chance to win the Super Bowl. Director Rob Markopoulos said the crew will shoot footage for each possible outcome of the Super Bowl. He said NFL Films has to work on a tight schedule because football is constantly changing. "Well film this today and by next week itll be done," he said. The video will be released Feb. 8, Markopoulos said. 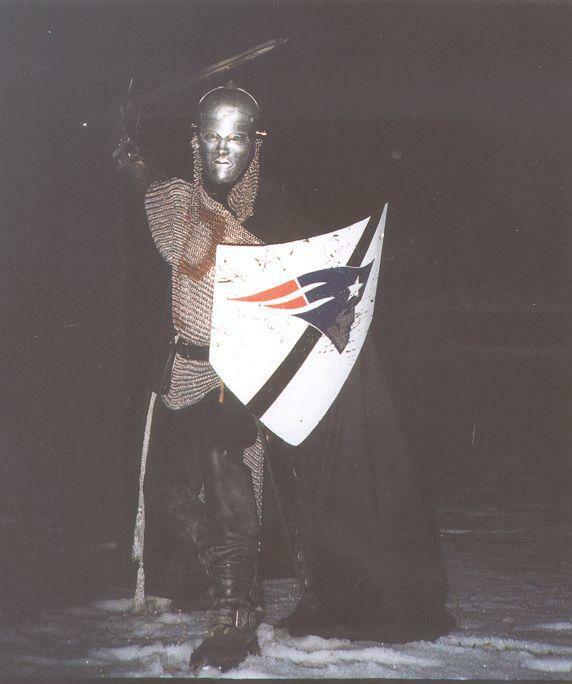 The Paladin Knight representing the underdog team, The New England Patriots! The Paladin holding the Vince Lombardi Trophy!